Cape Neddick Light also known as "Nubble Light", in York Maine was placed in operation in 1879. It is made of cast iron and lined with brick. The tower is 39 feet from the ground to the center of the lantern which shows a red light 88 feet above the ocean that flashes every 6 seconds that can be seen from 13 nautical miles away. The station originally had a fog bell operated by automatic striking machinery. In 1911 the skeleton frame bell tower was replaced by a white pyramidal tower, itself torn down in 1961. For a time the Nubble's 3,000-pound fog bell could be heard by the keepers at Boon Island six miles away. The bell was later replaced by a diaphragm horn. Picturesque Cape Neddick Light has probably appeared on more postcards, calendars and other souvenirs than any other New England Lighthouse. In fact, in 1977 when NASA sent Voyager II into space with artifacts designed to teach extraterrestrial civilizations about our planet, one of the images it carried was a picture of the Nubble Light! This wonderful, folky oil on canvas of Cape Neddick Light shows the skeleton frame bell tower. Inside the tower is the oil house that was built in 1902. 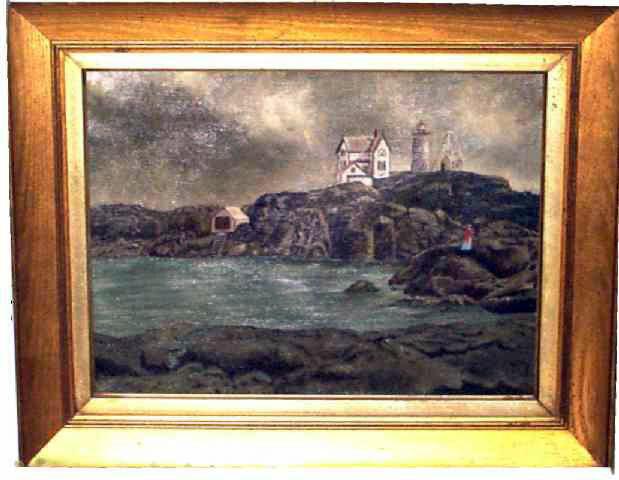 The walkway that connects the lighthouse to the keeper's cottage had yet to be built (1911), so that would date this painting somewhere between 1902 and 1911. Whether you are captivated by the romance of the Lighthouses off the rocky coast of Maine, or the mystical allure of the Nubble Light, you can see it, but you can't quite reach it as it is only accessible by boat . . . this wonderful painting captures the magic that draws us to Lighthouses and makes us wonder what it would have been like to live in the keeper's cottage and tend the light. Sight size is 15-1/2" x 11-1/2" and the painting is framed in a gold painted frame with a lemon gold liner.